The more children I have, the more I realize how fast the baby stage goes by! My 6th baby, Ahava is already 6 weeks old and it feels like it went by in the blink of an eye! With 5 other little ones vying for my attention, it can be easy to get overwhelmed and exhausted during this time, but it's also such a sweet time of loving on my baby and seeing my older children and husband fall in love with her as well. I wish there was a pause button to slow these sweet times down and fast forward button to speed through the difficult ones! My husband and I love the baby stage. (which is why we keep having them;) But it can also be difficult transitioning to caring for another little person; who often doesn't want to sleep when you do. Our days often go by so fast, as everything takes way longer to do. It's been so good to slow down and really reevaluate what is important. Knowing now how fast this time goes by, I have been trying to be more intentional about soaking up every moment with my sweet little girl. Holding her and getting in as much newborn snuggles and kisses as possible. Gazing at her while I'm nursing, instead of at Facebook or Instagram. Prioritizing household chores, so I don't get overwhelmed. Not taking on any extra projects or time consuming activities. Staying home instead of running around town and exhausting myself. Saying yes to kind friends and family who offer help and support. Knowing my limitations and saying no to people or things that I just can't commit to. Giving myself a lot of grace. Though I am not always good at sticking to all of these; I try to remember that no time is wasted as I cherish my newborn babe and enjoy her milky breath, soft velvety skin and sweet newborn smell. With my first baby, I have to admit that I couldn't wait for him to get bigger so I could interact and play with him... and not be so sleep deprived! Now I wish time would slow down so I could enjoy this precious time a little longer. And though it's not fun being sleep deprived, somehow over time you learn to survive with less sleep and even get used to it; well sort of. Having a newborn is not easy; whether it's your first or sixth. It's adjusting to a whole new life; with new demands and schedules that your body and mind are not accustomed to, or haven't been used to in a while. Although I can't get enough of the baby stage; it's not always sunshine and roses, so I try to make the most of the times when she is alert and happy. I was inspired by the Honest Co. to write about some of my favorite ways to bond with Ahava during this precious newborn stage. One of my favorite things to do to slow down and cherish this time is to make a ritual out of bath time and diaper changing.Though not all babies like this time, I am so glad my sweet baby does. Even her siblings want to get in on the action. It has been such a fun time of kissing her sweet feet and trying to coax a smile or a laugh out of her. When I lay her down to change her diaper , wipe her down and spray on some soothing bottom wash or slather on some homemade natural diaper cream. She smiles, coos and always perks right up; if she has been grumpy from a poopy diaper and sore bum. 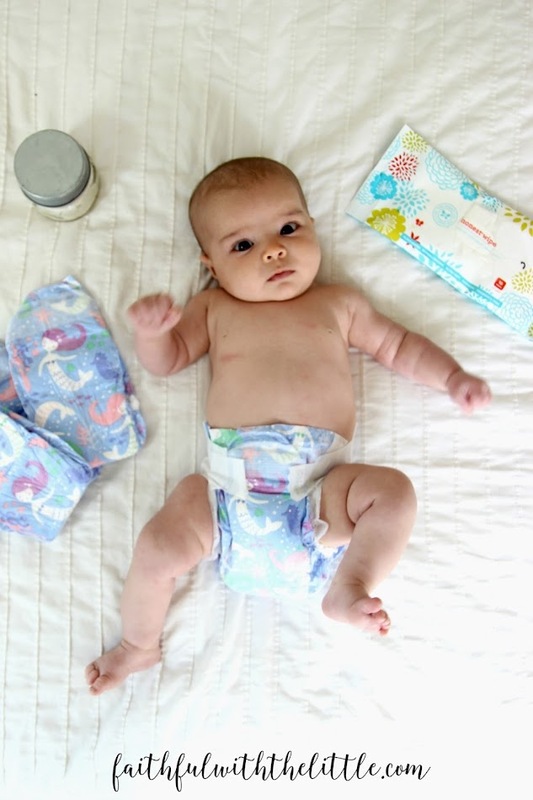 But who wouldn't be happy to wear these adorable diapers from Honest Co. I wish she didn't dirty them so fast! She also loves bath time! She might be the exception, but she has never cried once when I have given her a bath. I always know that if she is fussy and I give her a bath she will calm right down and fall asleep right after. Especially if I wash her with this wonderful smelling shampoo + body wash. All my kids use it, even my husband and I. 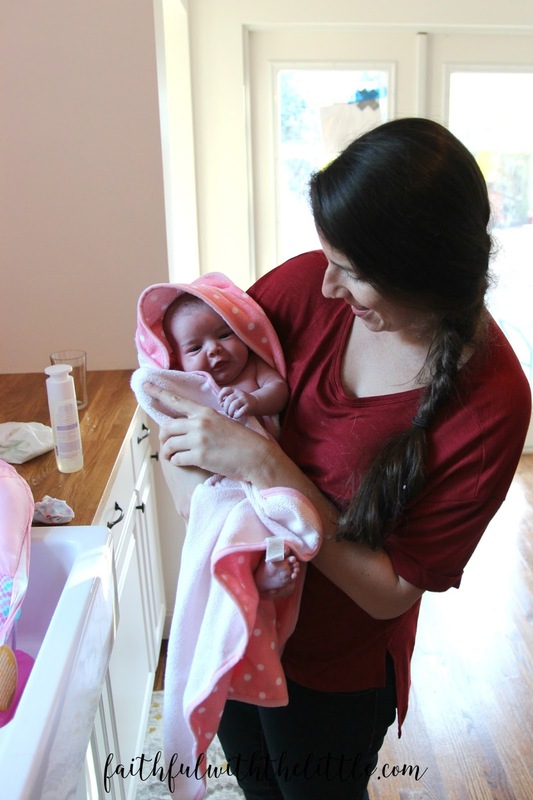 Because I wanted to make the most of this special time, I opted to give her, her first bath at home instead of letting the hospital do it. I think I waited a week before I gave her a bath. Am I the only one who doesn't want to wash off that newborn baby smell??? I am so glad I waited to give it to her myself, because it was so special! She handled it like a pro and I still remember how she looked at me and how much she seemed to enjoy it even at such a young age. Now I give her a bath almost every day just because she loves it so much and she smells SO good from the gentle fragrance of the shampoo + body wash. It's funny how she can get so smelly from sour milk and all the little gunk that gets stuck in her little toes and hands. Being a parent is no joke! It requires a lot of sacrifice, patience(or lack thereof) humor and grace. It can be hard to cherish these fleeting moments when a million other things or people are calling for your attention... and all you want to do is sleep. Believe me most of the time I wish I could take a nap and then when I do get a chance I can't fall asleep, thinking of all I need to do! I do know though, that I have never regretted a moment that I have spent cuddling her instead of folding laundry, or giving her extra attention instead of crossing off my to do list. I love how she calms right down when I pick her up and how she is teaching me what she wants and needs. Moments spent with your newborn are never wasted moments. So put that phone down, let the laundry pile up(for a little bit), make the most of the little moments...and remember that babies really don't keep. This is not a sponsored post but was inspired by the Honest Co. I love their safe, effective and eco- friendly products for family and home! I have included links to some of their products in this post that I hope you will check out and enjoy for yourself! 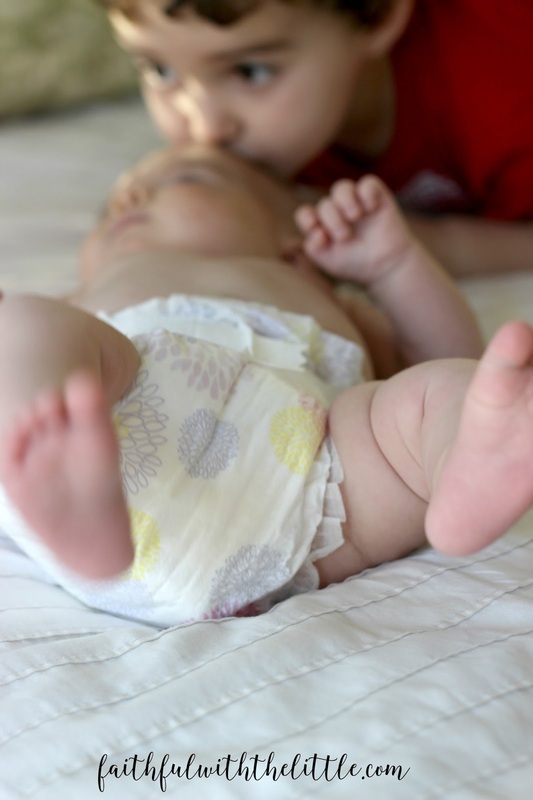 Do you love the newborn stage? Or are you struggling to get through it? What are some ways that you enjoy the little moments with your newborn? These little moments are to be treasured. It goes by so very quickly. I loved rocking my babies, I often did change table songs and games, and I cherished the quiet moments of breastfeeding. I was a newborn nursery RN, and I never got tired of it. Not even with 12 in the nursery and the screaming fussy one asleep on my lap while I charted. I had 3 boys and I would love to relive these moments with again. They do grow too fast! Blessings to you and your sweet little ones.